The world’s largest director institute. AmChamHK’s contents do not necessarily reflect the views of officers, governors or members of the chamber. We welcome your letters, comments & feedback. 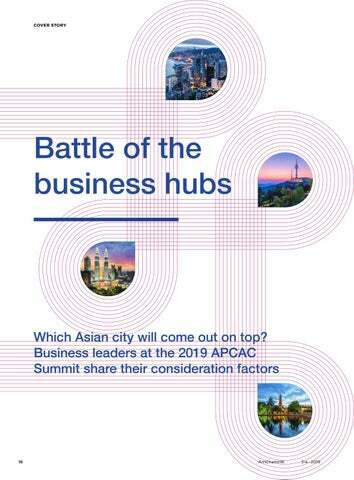 HUBS Which Asian city will come out on top? AmCham Hong Kong has started its 50th year anniversary celebrations with a bang: We’ve renovated our office after diving into our archives to find colorful photos of our storied past, we’ve hosted the annual summit of American Chambers from across Asia, and we held a one-week interactive exhibition celebrating our dynamic history at the Rotunda smack in the middle of Exchange Square. Next up: The AmCham Ball, which promises to be one heck of a party thanks to our chosen theme Motown. But in my mind, the best is yet to come. Along with celebrating the past, our theme this year is investing in the future. For me that means nurturing a strong pipeline of future chamber leaders and continuously making sure our communication methods reach the younger generation of talent. selecting our first cohort in June and the program begins September. I’m excited to announce we’ll be rolling out two new initiatives this year targeted at building a more substantial intergenerational mix. Now, all of this does not mean that we do not highly value our veteran and C-suite members. To the contrary. High-level discussion, sometimes behind closed doors, is a valuable part of the chamber. That will not change. Our second plan to invest in future talent is through incentivizing our most active companies to add additional members under the age of 35 at a discounted “NextGen” price. The first is a new competitive program AmCham Future Leaders, where we will provide rising executives under the age of 35 the opportunity to focus on building the leadership skills and professional connections they’ll need to lead into the future. My hope is that by the end of this 50th anniversary we will have both strengthened and modernized the chamber to play a key role in this most dynamic of cities, which many of us call home. Asia, Carrier Hong Kong Limited. Where is home? I am originally from Victoria and Vancouver in Canada. I have been in Hong Kong eight years now. What do you miss most about home? Probably the space! Hong Kong apartments are tiny. Tell us something not many people know about you. I nearly became an engineer instead. In another life, I would be… A university professor. First ever job? Paper route… not sure if that counts. So, first ‘real’ job was as a dishwasher and prep cook at a local pub in Victoria called 1550’s. Best advice you’ve ever received? You only live once, try everything because you will only regret the things you didn’t do. What do you like to do in your time off? Scuba dive, travel, hike, catch a movie or read a book. Something on your bucket list for 2019. Dive with hammerhead sharks. 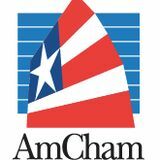 What attracted you to AmCham? Networking opportunities. Which AmCham event are we likely to find you at next? Perhaps a cocktail event or an interesting guest speaker event. Singapore and the Philippines. Most Chinese Malaysians can speak at least one Chinese dialect or language in addition to English – most commonly Mandarin or Cantonese. “For tech players in most places, there really isn’t a high barrier to entry. You just need somewhere with an electric grid, stable internet and connectivity,” he says. domestic consumer behavior. He warns against making general analyses about unfamiliar markets, as oftentimes you don’t get the full picture until you’re physically there. “Until you are in-market, you don’t know how difficult it is to disrupt ingrained consumer behavior. It’s hard to spot from a 10,000 foot view,” he says. “What about Korea?” asks someone from the audience. Yong says many of Korea’s challenges surround its business ecosystem and infrastructure, language and culture. When American and British companies look at potential hubs in Asia, the places they tend to consider first are Hong Kong, Singapore, Japan and South Korea. Between Japan and South Korea, he says companies will usually go with Japan. “The Koreans are good at exporting themselves, but letting the world in, not so much,” he says. China, for example, is working hard to end its overreliance on US technology. Jansen sees the potential of China’s Greater Bay Area for businesses like his in the apparel manufacturing industry in which the biggest challenge is how to “bring fabrics closer to needlepoint.” He praises manufacturing hubs like Shenzhen, where you can have full control over and access to all necessary components at each stage of the supply chain. “Labor is not the answer anymore, but how you streamline your processes,” he says. Liu says of Shenzhen’s supply chain capabilities: “There is something fascinating about there being nowhere else in the world where you can decide on the design of a new chip-set in the morning, and next day have a prototype ready, then be ready to manufacture and distribute to other parts of the world in a matter of days. Not even Silicon Valley can do that,” he says. With or without the full picture, the opportunity to get involved in China’s Greater Bay Area initiative is not one Tricor wants to miss out on. “As the Chinese say, ‘Build a bridge one stone at a time. It will emerge over the years, and you can wait, but by then you might have missed the boat.’ For our company, we’re going in, lock stock and barrel,” he says. To companies in this scenario, Yong’s advice is to “Take a lesson from the historical rulebook. “If it comes from the State Council you can believe it,” he says. Growing up CEO Meet Hillary Yip, the 14-year-old entrepreneur By Seher Asaf While most teenagers are scrambling to get ready for school in the early hours of the day, Hillary Yip begins her mornings by dedicating two hours to developing and refining her own tech business. At 7am sharp, the 14-year-old CEO is already immersed in the day-to-day grind of running her own language-learning app, MinorMynas, before taking on a full day of schoolwork. MinorMynas allows kids to learn new languages by engaging in live video calls with their peers. The app has almost 50,000 downloads on the App Store, which is quite a feat in a highly competitive app market notorious for churning out millions of new developments that often end up garnering little attention. Yip, a well-spoken and eloquent ninth-grader, spoke at AmCham’s annual APCAC conference this year. Since the launch of her app, the teenpreneur’s age and early success have earned her numerous public appearances, including interviews with major platforms such as BBC, SCMP, Tedx and MSN. Speaking in front of crowds is something she has learned to become comfortable with. “I’m pretty excited before the talks, I’m very hyper but I’m also very critical after a talk,” said Yip. As the public face of MinorMynas, she has come up against a fair share of doubters and disbelievers. While young entrepreneurs are often celebrated for taking initiative, they also face a bevy of criticism as they struggle to be taken seriously from their older counterparts. Criticism can rear its head in anonymous comments on social media platforms or even at public events. “When we do interviews, we always hear some really negative comments,” said Yip. “I know that this can cripple other startups.” However, as with most successful entrepreneurs, cultivating resilience in the face of adversity is an age-old lesson self-starters learn early in life. The young CEO tries her best to channel the criticism into a valuable learning experience. She says focus, perseverance and listening to constructive feedback in a positive way is the key to overcoming naysayers. “You need to be strong and clear about what your vision is,” she said. Work, life and school balance Yip has been homeschooled since the age of 11, which is right around the time she launched MinorMynas. While she often arranges her school schedule around the demands of her app, ultimately, MinorMynas takes priority. “Education is obviously something important, but MinorMynas is a once in a lifetime opportunity. If I leave it now, I won’t be able to go back to it in the future. Education is something I can go back to at a later date,” said Yip. Even though she values real-world experience, she hasn’t completely ruled out the prospect of going to university one day. She says she’s open to it if the university experience could offer something new, unique and valuable. While speaking at large-scale conferences and doing interviews with major media outlets is impressive for anyone, let alone a teenager, Yip says her friends don’t really talk about it. They are more interested in finding out about the things she sees at these conferences. Victory at the US$1.5 million LPGA Tour showcase event in Singapore went to 2018 world number one Park Sung-hyun of South Korea, and He was there in the tent signing off for her final round of play at the same time as the winner. She ended up tied for 57th and some 35 strokes behind but He had captured the imagination of the public and the media throughout the week at Sentosa Golf Club, more for what’s expected of her than what she has so far. He qualified for the US Women’s Open as an amateur at 15 and picked up a tournament win on the secondary Symetra Tour last year. He was given a special sponsor’s invite into a tournament that boasted the top-20 female players on the planet – including American stars Michelle Wie, Danielle Kang and Lexi Thompson. Signing on with the leading American and international sports management and talent agency IMG has her poised to cash in on the wealth of opportunities that are increasingly emerging in Asia as sports stars take their brands global. “If you look at the players here this week you can see how far the game of golf has taken them – both on and off the course,” said He. ‘When I was 16 I told myself that for part of my life I would like to run a school where I would like to be a child’ Dr Robin Lister, PhD, leans back and takes a long, deep breath when asked how the past seven months have played out. “I guess you could say it’s been a rapid learning curve,” laughs the Englishman. “It’s definitely been exciting.” We’re at Malvern College Hong Kong, tucked away inside the office provided for Lister’s role as founding headmaster. The school opened for business late last August within a seven-story building near the waters of Providence Bay, Pak Shek Kok, and the fringes of Hong Kong Science Park. Today is its grand opening and arrangements are being made outside to welcome Hong Kong’s chief executive Carrie Lam. But classes are still continuing – for the moment at least – and downstairs kids are mingling in the playground. “Starting a brand new school from scratch? I was naïve,” says Dr Lister. “The first few weeks were pretty full-on. Putting in structure, putting in the protocols and procedures. But now things are far smoother. It was quite an experience. It’s terribly fulfilling when you see everything just click.” Preparations for the school began with the opening of the Malvern College Pre-School Hong Kong in Southwest Kowloon in 2017, before applications and admissions began for the first intake of 400 students in years one to nine. From here, the plan is for an extra class to be added each year as the first batch of year nine students move through to year 12. The Greater Bay Area development has created many new opportunities for businesses in the region’s population of 70 million people. Findings from the 2018 Annual Survey of Companies in Hong Kong with Parent Companies Located outside Hong Kong, jointly conducted by InvestHK and the Census and Statistics Department, show that Hong Kong continues to attract an array of leading companies from around the globe. The results show there are 8,754 companies in the city with parent companies located outside of Hong Kong — a 6.4 percent increase from the year before. A third of these have parent companies based in the US. There are 1,530 companies using Hong Kong as their regional headquarters in Asia – an 8.3 percent increase from the year before. Survey respondents cited the city’s simple tax system and low tax rate, free flow of information, free port status and geographical location as favorable factors in their company’s decision to set up HQ here. AmCham members selected to take part in our next survey are encouraged to complete and return the survey by June 2019.
operating in Hong Kong’s various co-work spaces, private or government incubators. Subsequently, the number of new jobs created surged by 51 percent since the same period last year. Findings showed the local startup community is highly international in nature with 35 percent of founders coming from outside the city. The US ranks as the top origin of non-local founders, followed closely by the UK, Mainland China, Australia and France. The findings also showed that startups in Hong Kong are actively engaged in a range of industries including fintech, e-commerce, supply chain management, logistics technology, professional and consultancy services. judiciary, providing effective legal protection to individuals and businesses. As one of the world’s top financial centers, Hong Kong is also a strategic platform for fundraising and professional services that foreign companies increasingly leverage in their pursuit of projects along the Belt and Road. It’s an exciting time for American companies and entrepreneurs in Hong Kong. 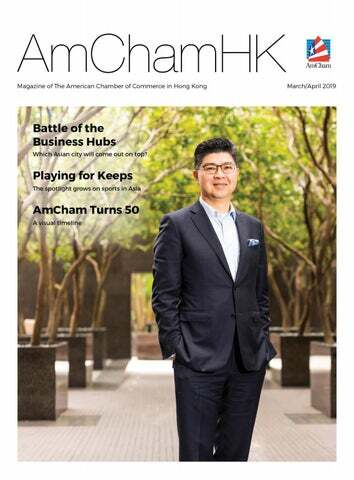 We would like to congratulate AmChamHK on turning 50 this year and look forward to working together to help American companies make the most of these new opportunities in Hong Kong. We help brands and the public communicate At H+K, we understand and keep up with the perpetual motion of todayâ&#x20AC;&#x2122;s global public. We reflect the voice of the public, at every intersection, especially when an important decision is at hand. Board level. Brand level. Reputation level. We help our clients communicate not just what they do, but what they stand for. Hill+Knowlton Strategies. Changed and changing. American International School 125 Waterloo Road, Kowloon Tong, Hong Kong universities and colleges in the United States and internationally. http://www.ais.edu.hk/graduationbeyond/ Cornell University, University of Toronto, University of California Berkeley, UCLA, University of Michigan, University of Melbourne, Boston University, University of British Columbia, University of California Davis, New York University, Claremont Mckenna College, University of Illinois Urbana Chicargo, King's College London, Lyola Marymount University, University of Edinburgh, HKU, CUHK, HKUST and many more worldwide. Serving Hong Kong’s local and expatriate families since 1986, the American International School (AIS) is a fully accredited, independent, co-educational international school for 885 students from Early Childhood through Grade 12 for children aged 3 to 18 years old. AIS offers a rigorous college-preparatory academic program based on US educational standards supported through international best-practices in teaching. Hours: Early Childhood 1 (half-day): 8:00 – 11:00am & 12:00 – 3:00pm Early Childhood 2 to Grade 12 (full-day): 8:00am – 3:00pm Facilities Swimming pool, Makerspace for student exhibitions, basketball and outdoor sportsgrounds, EngineeringDesign-Innovation (EDI), fine arts, music technology and science labs. AIS is a full Wi-Fi campus which supports a Bring Your Own Technology (BYOT) policy from Grade 5 to 12. Australian International School Hong Kong (AISHK) provides the best of both words. Undeniably Australian in culture and feel, AISHK is also a truly international community with families from 25 different nationalities. AISHK is a non-profit, co-educational day school for students from Reception (4 Years of age) to Year 12. Curriculum Operating on an Australian school year (late January to mid-December), AISHK is the only school in Hong Kong to utilise the Australian curriculum, with the option for senior students to undertake either the New South Wales Higher School Certificate (NSW HSC) or the International Baccalaureate Diploma (IBDP). Offering both an Australian and international curriculum, AISHK allows students to easily transition to and from Australia and around the world as confident and global minded young people. Whilst AISHK prides itself on the outstanding academic outcomes achieved by students in both HSC and IBDP results, the school is also highly dedicated to providing a learning environment which truly balances academic excellence and student wellbeing. AISHK seeks to educate the whole student, developing happy, young people with resilience, compassion and character. For over 27 years, Canadian International School of Hong Kong (CDNIS) has been known as Hong Kong’s innovative school. Through a holistic curriculum that focuses on the development of the whole person, CDNIS students are empowered to be empathetic innovators and leaders. Accredited by CIS and WASC, it is a school where students are valued, and their unique qualities in all things are celebrated. Technology plays a key role as students as young as Grade 1 not only learn how to code, but they also utilize 3D printers, laser cutters, virtual reality, and augmented reality. Through this, CDNIS ensures students have the skills, dispositions, and mindsets needed to succeed in today’s fast-changing world. This innovative approach to education led CDNIS to named by Cambridge Strategies Innovation 800 as one of the world’s most forward-thinking schools. tremendous opportunities to secure university places with no additional academic burden. CDNIS students achieve some of the highest IB results in the world with 13 members of the Class of 2018 achieving a score of 43 or more. For the upcoming graduating Class of 2019, 50% of the students joined CDNIS in Grade 1 or before, and stayed ever since. All CDNIS students, from Pre Reception to Grade 12, share life on one campus and are encouraged to maintain a balance between academics and extra-curricular opportunities. The school provides an incredibly diverse selection of extracurricular activities for a school of its size as students can select to participate in more than 70 activities, service groups, clubs, performing groups or school sports teams. Delia School of Canada (DSC) prides itself on being a multicultural School with over 1300 students enrolled from 45 different countries. DSC offers the Ontario curriculum from Pre-Grade 1 to Grade 12 and the Alberta Program to students in Grade 1 to Grade 9. Graduates from DSC enter top universities in Canada, the United States, the United Kingdom, and globally. The vision of DSC is to inspire all to strive for excellence, be the best they can be, and contribute to a better world. DSC is dedicated to the pursuit of educational excellence in guiding students to become successful global citizens in our ever- changing world. Our mission is to provide students with an education that prepares them to become global leaders that are confident to contribute positively to their community. Our teachers create inclusive, stimulating and challenging environments where students prepare for jobs of the future by analyzing, creating, collaborating and communicating their knowledge in a multicultural environment. Our school day begins at 8:15 am and goes to 3:00 pm Monday to Friday. DSC focuses on developing studentsâ&#x20AC;&#x2122; communication, collaboration, and problem solving skills while fostering creativity. Technology is integrated throughout the curriculum, our grade 1-3 students have access to a 1:1 iPad program while students in Grade 4 to Grade 12 are on a 1:1 laptop program. DSC offers extensive extracurricular activities, experiential learning opportunities, and summer school programs. The English Schools Foundation (ESF) is the largest Englishmedium international school organisation in Hong Kong. Our 22 schools and comprehensive programme of extracurricular activities bring out the best in every student through a personalised approach to learning and by inspiring curious minds. Our strategic intent is to be the key driver of best practice in teaching and learning. Our model of education is on the cutting-edge of global innovation producing excellent outcomes for our students. There are 17,770 students from 75 different nationalities in ESF kindergartens, primary, secondary and all-through schools. About 70% of our students have parents who are permanent residents of Hong Kong. ESF is proud of the high academic and wider achievements of our students. In 2018, 16 ESF students achieved the perfect score of 45 points in the IB Diploma examinations; more than 95% go on to leading universities worldwide. Vision and Mission Our vision is for every student to be the best that they can be. Our mission is to inspire creativity and nurture the global citizens and leaders of the future. We do this by creating joyful learning environments. led by a community of exceptional teachers who bring out the best in every child through a personalised approach to learning and by inspiring curious minds. Admissions For parents wishing their children to enter K1. Year 1 and Year 7 Central Application is open from 1 to 30 September of the year before they want their children to enter the school. FIS was established in 1963/64 as one of the first international schools in Hong Kong. The school offers two streams: the French and International Streams, preparing students towards certification in the French national examination, the French Baccalaureate, or International General Certificate of Secondary Educations (IGCSE) and the International Baccalaureate Diploma Programme (IBDP). In 2018, FIS is celebrating 30 years as an IB World School. they develop as global leaders. As the regional host of the International Schools Theatre Association (ISTA), we inspire students to discover themselves and engage with the world through the performing arts. Admissions Our programme empowers students to pursue their pathways to individual excellence, ready to contribute their creative and critical thinking skills to a sustainable future. We have ongoing admissions throughout the school year and invite you to learn more about our differentiated programmes and welcoming community. Contact our admissions team at admissions@hkacademy. edu.hk to arrange a personalised tour of our captivating learning environment. Hong Kong International School Lower Primary & Upper Primary School: 23 South Bay Close, Repulse Bay. Middle School & High School: 1 Red Hill Road, Tai Tam. School Profile Hong Kong International School (HKIS) is a leading private co-educational college preparatory school for students from Reception One (pre-kindergarten) to Grade 12. Since 1966, HKIS has provided an American-style education grounded in the Christian faith, and respecting the spiritual lives of all. Our programs reflect the rich multicultural and international character of our student body with an emphasis on Chinese language and culture. Learning and Student Life HKIS provides educational excellence with an emphasis on inquiry, compassion and community service across all grades. We offer courses that challenge and inspire students, and our graduates attend the top universities around the world (80% attend US institutions). Our High School offers 27 Advanced Placement (AP) courses. Education outside the classroom allows students to deepen their educational experience through cultural immersion and service learning. HKIS offers a multitude of co-curricular activities, dozens of clubs, and has a competitive athletics program with over 50 teams competing in local and international conferences. academic standards and expectations of self-motivated and collaborative learning. Applications are accepted year-round, with priority deadlines on October 31 for Reception 1 - Grade 5, and February 1 for Grades 6-12. Tuition fees: R1 - Grade 5: $196,200; Grade 6-8 $201,900; Grade 9-11 $225,000; Grade 12 $225,950. Annual capital levy: $20,000. Applicants can apply up to 2 years in advance. Facilities HKIS recently redeveloped its elementary schools in Repulse Bay, creating a purpose-built facility to support early childhood learning through play. Middle and High Schools in Tai Tam boast world-class facilities including robotics labs and makerspaces, classrooms equipped with modern learning technology, science labs, music and art studios, performance spaces, a swimming pool, tennis courts, and a large track and sports field. Island Christian Academy seeks to educate the whole child in a nurturing, vibrant and international community, to cultivate individuals of character, compassion, courage and competence, and to inspire the next generations to be a global people of Christian faith, a people serving others. Island Christian Academy celebrates students’ growth: not only their strong academic achievements and their high performance in independent assessments; but also their development into kind and generous members of our community who delight in learning from each other’s different cultural backgrounds, and who consistently support and encourage one another. Since opening in 2012, IslandCA has strived to develop with excellence, building on Generations Christian Education’s over 30 years of experience in Hong Kong and the Chinese YMCA of Hong Kong’s more than a century of educational ministry. Island Christian Academy is proud to be Hong Kong’s first IPC Accredited School and a member of the Council of International Schools. Transport: School bus service available. Curriculum: Learning is structured around the enquirybased International Primary Curriculum (IPC) & International Middle Years Curriculum (IMYC), bolstered by Australian Mathematics curriculum, UK National Literacy Framework, and Journey 2:52 Christian Studies curriculum. Hours: 8am-2:30pm Fees Y1-6: $122,300 (subject to EDB confirmation), details on website Y7+: 134,700 (subject to EDB confirmation), details on website Facilities: Outdoor and indoor PE facilities including climbing wall and rubber multi-sports surface, as well as regular access to nearby playing fields and indoor pool; science laboratory; music, art, ICT, Chinese studies and learning support rooms. Kellett School, The British International School in Hong Kong, was founded in 1976 as a not-for-proﬁt Association by like-minded parents providing a high quality, British-style education to English speakers in Hong Kong. The School’s aim is to engender ‘a love of learning and conﬁdence for life’ in each of its students. This aim is accomplished by ensuring the students achieve personal academic excellence, are conﬁdent, articulate and gain a wide range of transferable skills. Kellett is a through train school with two campuses, the Pok Fu Lam campus and the Kowloon Bay campus. The Pok Fu Lam campus is a Preparatory school (age 4-11) and is located in Hong Kong’s Southern district of Wah Fu at the foot of Mount Kellett and overlooking Kellett Bay. The Kowloon Bay campus offers Preparatory and Senior places. The Senior school is four form entry, guaranteeing all Kellett preparatory students a senior school place and at capacity offering up to 600 places. Kellett School follows the Early Years Foundation Stage (EYFS) and English National Curriculum, which begins in Reception and runs through to the end of Year 13 and includes GCSE, IGCSE and A levels. Kellett has grown to earn an enviable reputation as one of Hong Kong’s leading independent International Schools where students learn with growing independence, in a challenging and stimulating environment. High academic achievement is realised within a broad curriculum embracing creativity, the arts and sports, whilst taking into account its unique position in South East Asia at the gateway to China. Kellett School looks to develop students both inside and outside the classroom. The school offers a rich and varied programme of extra-curricular activities that contribute to the development of the student as a whole. These include local and overseas educational visits, a rich repertoire of performing arts opportunities, sports and activities of general interest. Malvern College Hong Kong (MCHK) inherits its rich heritage and ethos from Malvern College UK, a coeducational day and boarding school founded in 1865. Renowned for its innovative approach to education, the school was one of the first in the UK to adopt the IB Diploma programme. Leveraging Malvern College UK’s 25+ years’ experience in IB teaching, the Hong Kong campus offers a globally accepted and well-established curriculum. The school also adopts Malvern College’s inclusive, personalised philosophy of nurturing every child’s individual strengths and abilities, under the guidance of dedicated and highly qualified teachers. MCHK is a candidate school for the International Baccalaureate (IB) Primary Years and Middle Years Programmes and pursuing authorisation as an IB World School. The school places strong emphasis on Science, Technology, Engineering and Mathematics, and all pupils learn Mandarin and simplified Chinese. Malvern College Hong Kong provides the ethos of a traditional British boarding school within a contemporary day school setting. At its core is the provision of small class sizes, personal tutors, and strong pastoral care within a house system. MCHK ensures that each pupil maintains a keen academic focus and also benefits from a rounded education which attaches significant importance to cocurricular activities including art, drama, sports, music, and service within the community and beyond. The school is also one of the first schools in the territory to run the Forest School programme. Led by qualified Level 3 practitioners, pupils build confidence, self-awareness, and social skills, while learning about the natural world through their experiences in a woodland environment. Located adjacent to the Hong Kong Science Park, MCHK opened its doors in August 2018 and will ultimately provide 1,000 places for Primary and Secondary pupils. The school also offers the opportunity for pupils to study at The Downs Malvern from Year 7 and Malvern College UK from Year 9 (subject to fulfilling relevant entry requirements). Nord Anglia International School Hong Kong Lam Tin Primary and Secondary School: 11 On Tin Street, Lam Tin, Kowloon Tai Tam Pre-school: Red Hill Plaza, Red Hill Road, Tai Tam, Hong Kong Sai Kung Pre-school: 285 Hong Kin Road, Tui Min Hoi, Sai Kung, New Territories with musicians; and the Massachusetts Institute of Technology (MIT) – bringing a new approach to learning the interdisciplinary subjects of Science, Technology, Engineering, Arts and Mathematics (STEAM). Furthermore, Nord Anglia’s partnership with UNICEF enables students to take a leading role in the global discussion about key issues affecting our world, culminating with a visit to New York to present at the United Nations. School Profile As a parent, you want the best for your child. So do we. That’s why we enrich your child’s learning experience with opportunities beyond traditional education and collaborate with world-leading organisations. Nord Anglia International School Hong Kong (NAIS Hong Kong) is a member of Nord Anglia Education’s (NAE) global family of 61 premium schools located in 28 countries around the world. In total, we look after more than 61,000 students globally. Our global scale enables us to recruit and retain the best teachers in the world. NAIS Hong Kong offers an all-through education for students aged 3-18, with specialist teachers in Music, Art, Drama, PE and Mandarin from the very start of a child’s educational journey with us. We provide an all-round education, beginning with the English National Curriculum, from the Early Years Foundation Stage to IGCSEs, followed by the internationally accepted IB Diploma Programme. Through our Global Campus programme that unites all our NAE schools worldwide, students also gain access to virtual learning and exchanges, developing a truly international perspective. We are ambitious for our students, believing there is no limit to what they can achieve – our approach supports and nurtures every child to succeed academically, socially and personally, helping them go beyond what they thought possible. We encourage every student to love learning, to try something new, and, above all, to be ambitious. Facilities (vary according to campus) A 3-storey multi-purpose hall, 25m swimming pool, large outdoor play areas, climbing walls, library, learning centre, drama studio, cafeteria, maker space, specialist music and art rooms. Norwegian International School Primary Campus: 170 Kam Shan Road, Tai Po, New Territories. Kindergarten Campus: 175 Kwong Fuk Road, Tai Po, New Territories. Founded in 1984, Norwegian International School (NIS) is an international kindergarten and primary school located in Tai Po, with a family-like Christian environment and a closeknit community. NIS provides attentive pastoral care to its students, laying the foundation for achieving academic and personal goals. The school takes pride in its location in beautiful Tai Po, with the primary school campus boasting of a natural green environment with a large outdoor sports field, and the kindergarten campus of its heritage building furnished with a spacious woodland playground. Learning at NIS is structured around the enquiry-based International Primary Curriculum (IPC) and International Early Years Curriculum (IEYC). The IPC and IEYC are comprehensive, thematic, creative curricula with a clear process of learning and with specific learning goals for every subject, for international mindedness, and for personal development. NIS equips its students with the skills, knowledge, and understanding with which to thrive in secondary school and beyond. Curriculum International Primary Curriculum (IPC) & International Early Years Curriculum (IMYC), bolstered by Australian Mathematics curriculum, UK National Literacy Framework, and Journey 2:52 Christian Studies curriculum. Facilities Spacious campuses in peaceful Tai Po location, large outdoor sports & play area with artificial turf sports field, auditorium, and learning support room. Classrooms equipped with audio visual equipment. As one university with multiple locations — in Hong Kong, Savannah, Atlanta, Lacoste; and online through eLearning — SCAD opens up a world of opportunity. From the heart of the Sham Shui Po district, SCAD Hong Kong offers the area’s largest concentration of art and design degree programs, providing an authentic, engaging learning experience that prepares students for successful international careers. SCAD Hong Kong students are guided by esteemed professors and benefit from advanced technology. In the historic SCAD-restored North Kowloon Magistracy Building, students have access to digital labs, darkrooms, fashion and interior design resource labs, a green screen and other specialized resources. According to a recent study, 99 percent of Spring 2017 graduates were employed, pursuing further education or both within 10 months of graduation. An award-winning legacy SCAD is one of the world’s most comprehensive art and design universities, with more than 100 programs of study across more than 40 majors. SCAD Hong Kong offers 22 degree programs including fashion, graphic design, interactive design and game development, photography and user experience (UX). Through the SCADpro program, students join forces with the world’s leading companies, from Disney to MTR. Learn more at scad.edu Courses of study are registered with the Hong Kong Education Bureau, registration numbers: 261958261971 and 262196-262202 and 262909 It is a matter of discretion for individual employers to recognize any qualification to which these courses may lead. Small World Christian Kindergarten is an international kindergarten that has educated curious young learners for more than 30 years, welcoming families of a diverse range of backgrounds, faiths, and nationalities. The school offers a warm and caring environment, with plenty of indoor and outdoor learning space and an outdoor playground amongst the trees. Small World’s play-based programme supports learning and development through holistic enquiry, nurturing young children’s natural curiosity, building their confidence and igniting their desire to learn. Small World is committed to whole-child development and learning in close collaboration with families. The kindergarten is the hub of an active community, with parenting courses, parent volunteer opportunities, and parent involvement helping to forge strong family-school partnerships. A member of Generations Christian Education, alumni of Small World have a priority in admission to Island Christian Academy and Norwegian International School. Transport: School bus service available. Curriculum: International Early Years Curriculum Hours: Morning class: 9am-12pm; Afternoon class: 1pm-4pm Fees $60,300/year (subject to EDB confirmation), details on website Facilities: Peaceful, green location in Mid-Levels, with indoor and outdoor play areas. School Profile Victoria Educational Organisation (VEO) has been a leader in early childhood education in Hong Kong since its establishment in 1965. With the motto, “Bilingual Learners Today, World Citizens Tomorrow – Love to Read, Eager to Inspire, Learn to Care”, VEO aims to instil a love of learning, a strong sense of social responsibility, and global vision at an early age. It has a strong, well-established presence throughout Hong Kong with eight nurseries and kindergartens located around the city. Setting itself apart from other preschools in Hong Kong, VEO provides an all-encompassing, rich multicultural learning environment that blends both Eastern and Western cultures. It offers two streams of classes: Trilingual (English, Putonghua, and Cantonese) and Bilingual (English and Putonghua). Through its effective one teacher-one language co-teaching approach, teachers who are native speakers of the languages work as a team to provide a total immersion language environment. Being the pioneer in early childhood education, VEO took the lead to conduct a research initiative with Project Zero, at the Harvard Graduate School of Education to understand how maker-centered learning can provide a framework for early years students to develop skills and knowledge within and beyond the STEAM disciplines. With its tireless efforts in providing quality curriculum, VEO is the only Columbia University Teachers College “Reading and Writing” Project (TCRWP) preschool in Hong Kong that is also accredited by the International Baccalaureate (IB) Organisation. Subject to interview results, VEO students are given priority in admission to affiliated Victoria Shanghai Academy. Yew Chung International School 3 To Fuk Road, Kowloon Tong, Hong Kong School Profile Founded in 1932, Yew Chung has been providing quality bilingual education to the learners of Hong Kong for over 86 years. Originally specialising in Early Childhood Education, Yew Chung International School (YCIS) now provides education from early childhood through primary and secondary culminating in the International General Certificate of Secondary Education (IGCSE) and International Baccalaureate (IB) Diploma Programme. Global Education in YCIS YCIS offers the unique richness and diversity of both Eastern and Western cultures that equip children to be bilingual, global-minded, competitive, appreciative and caring global citizens. Students are nurtured in a multicultural environment with a fully rounded and balanced education which transforms them into global thinking individuals. Integrating East and West YCIS combines the best of Eastern and Western cultures by promoting fluency in two major world languages, creating a truly bilingual learning environment, providing courses of study in Eastern and Western philosophy. Co-Principals and Co-Teaching Models Two Co-Principals, one Western and one Chinese, serve as partners in the operations and administration of the school. In addition, two fully-qualified teachers, one Western and one Chinese, together plan lessons and conduct classes in the Early Childhood Education and Primary School, and providing excellent role models who respect and value one another’s culture. YCIS Education Programme YCIS’s international curriculum is based on the learning criteria and framework from the National Curriculum for England (NCE). The research based curriculum allows high standards and ease of transition for international students. A Bilingual focus within a multicultural environment will give your child the global mindset and intercultural competence they need for the 21st Century. Unique Co-Teaching and Co-Principals models help students to learn two cultures and give equal emphasis to both English and Chinese. YCIS integrates Character Formation programmes into our curriculum, focusing on developing positive qualities. Strong music programme enhances children’s reasoning skills, develops memory span, concentration and coordination. YCIS maintains 100% university placement with students admitted to top universities in Hong Kong and overseas. YCIS Early Childhood Education (ECE) plans to open a new campus in Tseung Kwan O in 2019-20. Contact us to learn more. ITS Tutorial School 4/F, BOC Group Life Assurance Tower, 134-136 Des Voeux Road Central We offer the International GCSE & International A-level through small-class learning. Every student has a tailor-made qualification suite for their particular needs. We are an official UK university entrance centre and we provide a highly successful US admissions program. Transportation, fees and hours Next to MTR stations & bus stops. Fees are on a case by case basis. Open Monday to Saturday 9am to 8pm. Students get a personal timetable within these times. Our Business programme is for those wanting to stay in Hong Kong and take a globally recognized diploma after school which can convert to a Bachelor with one extra year. Who are our students? Our students have a wide variety of reasons for choosing an alternative route. Here are a few: •	flexibility in location •	homeschoolers •	retaking exams •	special educational attention or exclusions needing a 2nd chance Admissions Non-selective. The Woodland Group Of Pre-Schools With over 40 years of Pre-School excellence, our early years teaching will give your child the best start in his or her developmental journey. Our schools are in prime locations, ensuring that we are a pivotal part of the local community and ease of access for parents. Eight of our schools are located on Hong Kong Island. Part of the Cognita Group of Schools, Woodland benefits from global experiences and innovation. The Cognita family, provides an invaluable network of over 70 schools around the world as well as a through train experience from 6 months until graduation. Which Asian city will emerge victorious? Regional experts reveal which place they're putting their money on in our Mar/Apr cover story.